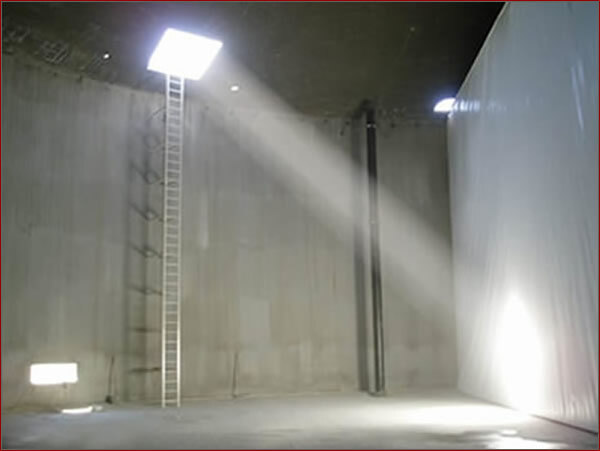 ETP’s Suspended Baffle Curtains are specifically designed to improve flow patterns in circular and rectangular tanks, both concrete & steel structures.. Flow diversion patterns include flow under, flow over, flow around and flow through configurations to match your treatment requirements. The factory prefabricated systems install quickly and easily with standardized mounting hardware in new and existing tanks. ETP’s Water Tank Baffles provide a dependable, low maintenance alternative to costly concrete, steel, wood or fiberglass baffles. The Suspended Baffle Curtains are custom manufactured from NSF 61 approved for contact with potable water materials to fit the profile of your new or existing water treatment tank. Heavy duty reinforced geomembrane materials combined with stainless steel or optional FRP hardware provide a durable, maintenance free service life of up to 20 years. All fabricated seams are Thermal welded to provide a bond that is just as strong as the parent material – inferior sewn seams are not allowed. Each Suspended Baffle is custom built to fit your tank and anchored to the tank walls, floor, and ceiling to prevent short circuiting, provide greater contact time and optimize the retention time. Hydraulic flow can be directed through windows in the baffle curtain, or around the end of the baffle. Cells and Grids can be created using bolt through “T” connecting battens making the Baffle Curtain System design flexible so that the most efficient flow pattern may be achieved to suit your particular requirements. We believe you will receive superior performance and value with ETP’s Channel Master suspended floating baffle curtain system. Our quality approach has attracted customers ranging from the small municipalities to the fortune 500 corporations. Engineered Textile Products has led the industry in manufacturing the highest quality suspended baffles for potable water applications for over 20 years. Call us for more information. 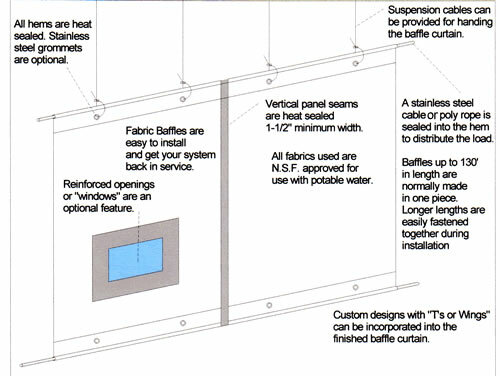 The Suspended Baffle Curtain is a prefabricated baffle curtain. It is designed to create beneficial flow patterns, improved chlorine contact time, improved retention time, and improved setting time in your water or wastewater treatment applications.